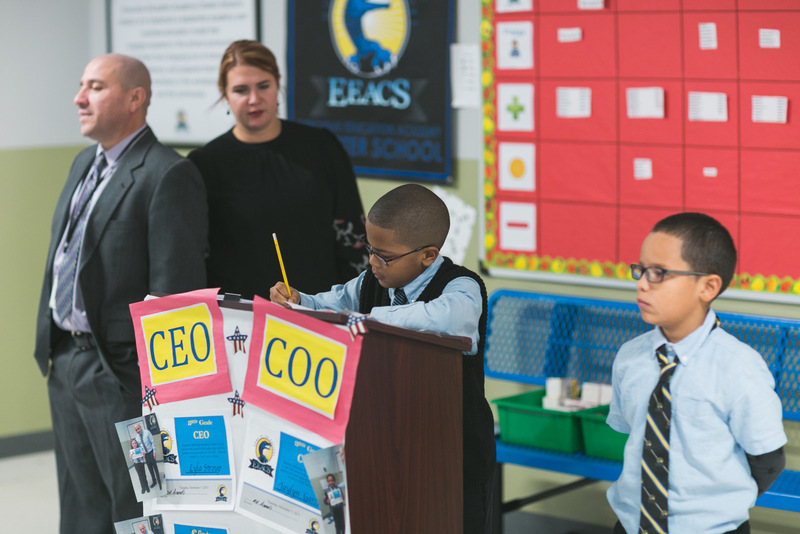 Executive Education Academy Charter School in Allentown boasts one of the only business education programs for grades K-12 in the Lehigh Valley. With plenty of internships, volunteer opportunities, and community partnerships, EEACS students are learning the skills they need to be college-ready and workforce-ready well before graduation. Technology is always changing and its role in the workplace is only going to grow. This is why we help our students understand the importance of technology early on. Starting in kindergarten, students learn keyboarding and software. They also learn more advanced skills like graphics and spreadsheets. Very quickly, students see technology as something much more than games on an iPad. They see technology as a way to tell stories, find patterns, and interact with the world around them. It’s never too early for students to start thinking about what they want to do when they enter the workforce. Of course, their path may change from doctor to teacher to engineer, but the skills they need to succeed—like understanding and listening and leadership—stay the same no matter which path they ultimately choose. Students in grades 6-8 are enrolled in classes on culture and diversity, human resources, financial management, leadership, and savings strategies. They learn how to be understanding, responsible, and kind leaders in any field, and learn about all of the career possibilities open to them. For most students, field experience and internships don’t start until college. At EEACS, however, field experience starts in 8th grade. Students spend time with mentors in the areas of their choice, getting a first-hand glimpse at how these community leaders run their business, treat their patients, or teach their students. This experience makes it easier for students to grasp whether or not the track they thought they wanted to follow is actually the right fit. They come to learn a little about themselves and their goals in the process. With nearly three dozen community partners from Minsi Trail Council to the YMCA, every student has the chance to get involved in their community. They can join clubs, play sports, and volunteer at local events. Our partners sponsor events, visit the school, and provide our students with opportunities other schools cannot. Barely a week goes by when our students aren’t partnered with a local business or nonprofit, or when a local entrepreneur isn’t visiting our school and talking to our students about ways they too can start their own business or change their neighborhood for the better. Learning doesn’t stop behind the walls of 555 Union Boulevard. It only just begins. If you want your child to experience the benefits of our robust, challenging, and inspiring business education curriculum, schedule a tour of our Lehigh Valley charter school to begin the enrollment process.